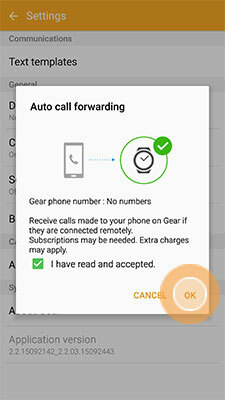 When your mobile device and Gear S2 are connected via Bluetooth, calls to your mobile number will display on both devices and you can answer on either device. 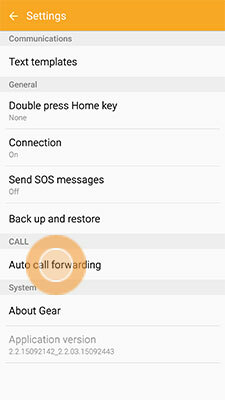 However, when your devices are connected remotely (not via Bluetooth), you must turn on Call forwarding to have calls to your mobile device forwarded to your Gear S2. You can take the calls on your Gear S2 from the device itself or through a connected Bluetooth headset. Important: You can only make a phone call using your Gear S2 only if it is a 3G/4G model (with an embedded SIM card). Not all Gear S2 are 3G/4G compatible. 3G/4G models are more expensive than basic models. If you are not sure, contact the store you purchased the device from. Another possibility is to take a phone call on your smartwatch. If the screen displays “Making call on your phone” then it means that your Gear S3 is NOT a 3G/4G model. 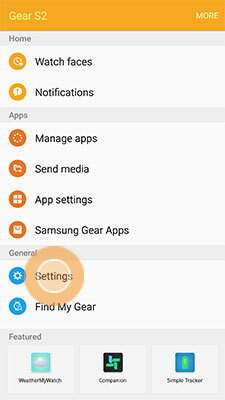 Follow the steps below to set up your mobile device so that when it is not connected to your Gear S2 via Bluetooth (remote connection), calls are still forwarded to your Gear S2. 1 From the Home screen on your mobile device, touch Apps. 4 Touch Auto call forwarding or Call forwarding. 5 Review the terms, which vary by wireless service provider, and mark the checkbox to accept. 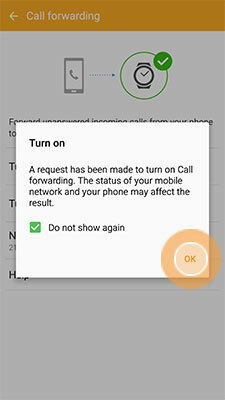 Touch OK.
6 Touch Turn on > OK or touch the slider to turn Auto call forwarding on. 7 Your mobile device will make a call to authorize call forwarding. Follow the instructions on the authorization call to complete Call forwarding set-up. Gear S2: How can I make a call on my Samsung Gear S2?